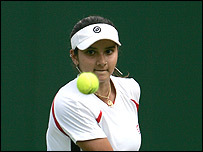 "Sania Mirza - remember the name." So spoke the BBC's television commentator as the Indian tennis ace crashed out of Wimbledon yesterday. But judging by the British press coverage of her performances at the championship, people could be forgiven for thinking she had won the tournament rather than made a courageous exit on day three. "Magical Mirza the centre of attention" reads the headline in the Guardian. "It was often hard to believe that Sania Mirza was really the loser yesterday," the paper says. "The 18-year-old from Hyderabad was the one whose Centre Court debut attracted the curiosity, hers was the personality which triggered a chain of interviews, and hers was the performance watched by vast numbers on television in India. "Her conqueror, Svetlana Kuznetsova, the US Open champion and a contender for the Wimbledon title, had just achieved a dramatic 6-4, 6-7, 6-4 revenge win. "But it did not look like it. By comparison with the attention given to her opponent, she was largely ignored," the paper said. Similar compliments came from The Times. "Mirza has the power and audacity to go much farther but will need to cut down on unforced errors," it said. "Centre Court will want to see more of the tempestuous teenager breaking the mould of the traditional Indian woman as well as records every time she steps on a court." Rave reviews about the teenager's performance also appeared in Britain's tabloid press. The Sun newspaper says she was the first Indian woman to have reached the second round at Wimbledon, pushing fifth seed Svetlana Kuznetsova hard. "Around 500 million people saw her battle on TV - and cop a warning from the umpire for throwing her racket," the paper says. The Sun says that Ms Mirza appeared after the match wearing a t-shirt bearing the words: "Well-behaved women rarely make history". "I was telling myself to keep cool," The Sun quotes her as saying, " but I still lost my temper once." While other newspapers did not give Ms Mirza such prominent coverage, the coverage was no less complimentary. The Independent refers to her as a "talented debutante" while the Daily Telegraph says that Svetlana Kuznetsova frequently found her Indian opponent's "booming ground strokes too hot to handle" before calling on her greater experience to squeeze through.